It's kind of insane to see how Uncle Acid have navigated their meteoric rise from being a weird psych rock band that I was really into when I was 15 because they sounded like Blue cheer into one of the worlds dominant stoner rock forces. I will never forget theeing the band three years ago at New Yor's old Webster Hall. The entire audience was pulsing with their energy. The band exploded from being just another stoner rock group into one of the most important rock acts of their generation, even touring extensively with Black Sabbath. This new offering, Wasteland simply builds on the greatness of Night Creeper and takes the band even further than before. While Uncle Acid & The Deadbeats would have been totally within their rights to phone it in since they are already a massively selling band, they instead leveled up their game. While the traditional Uncle Acid fuzz is still here the band brings in a healthy level of dynamics and sonic expansion serving to make this one of their most exciting offerings to date. You get lost in the tension and release of this band, the massive riffs and the sense that while these guys would have fit in right next to Black Sabbath and Budgie, they also stand as a part of something that is distinctly 2018. 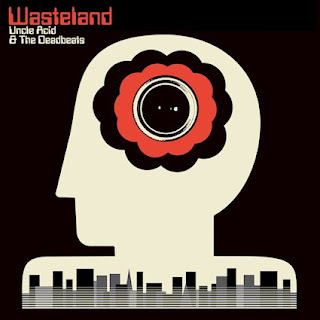 Uncle Acid & The Deadbeats have been on the comeup for a while now and for good reason. This is a band who don't take no for an answer and see to be continually blasting off towards exciting new futures. They are a band who have no concern for the scene because they define the scene. This is a group on a whole different level, a group who could very well be among the next group of arena rockers. It's not easy to see these things, but here we are, and Uncle Acid & The Deadbeats seem destined to come out on top.